We're in Eugene, Oregon at the Green Pastures Cemetery where a casket containing a man is being lowered into the ground while surrounded by his loved ones... and a small crew of folks carrying shovels. Having recently attended a funeral... my first, actually... I was surprised to see that there actually is such a crew... standing right by the family. I mean, it's obvious... and necessary... just so weird, right? Anyhoo... ashes to ashes, funk to funky... bada-bing bada-boom... dude's in the ground. The crew finishes up, and the lone female member (Gwen) breaks off from the group claiming that she's forgotten her bag. We follow the girl into a crypt where she is met by another young lady... one wearing fashions that are perhaps a bit passed their date. Her name is Ellie, and she is utterly bored. She's also quite dead... like 40 years dead. Did I mention that yet? She is Gwen's ghostly pal... and is in dire need of a "girls' night out". Gwen relents and offers to take her to "Dixie's". We shift scenes to a paintball course, where a young man (Dave) loses his crew. He wanders through the woods a bit looking for his pals, but instead comes across the course's referee. The attractive young lady shines her flashlight in his face, and razzes him about not wearing his goggles... before informing him that she is "starving" while flashing the camera a pointy-toothed vampiric smile. Back at Dixie's Firehouse Diner we meet... Dixie... and a fella called Spot... er, Scott. Gwen and Ellie enter and are invited to join Scott in his booth. He very clearly has a thing for Gwen, and tonight... is bearing gifts... well, gift. It's a vintage Dixie Mason Action Girl doll... the type of doll Gwen says Ellie reminds her of. He continues to pathetically hit on Gwen, and we learn that he is some sort of were-creature when the full moon hits. I guess that explains the unibrow... or monobrow... or however you say "dude's only got one eyebrow". We head back to Dixie's, where Gwen and Ellie are leaving. Gwen believes she recognizes a man from her "previous life"... and runs past him to avoid making contact. We follow the girls to a back alley where they pass a car with two men inside. From their point of view, they only see Gwen... which answers a question I was going to ask. Anyhoo... one of the men, Horatio, lost someone close to him called Bethany. The other fella, sigh, Diogenes notes that there has been an increase of "postmortem activity" in this town, and it's up to them to find out why. The girls return to Green Pastures, and Gwen notes that it's time for her to eat. Ellie understands that Gwen is self-conscious about people watching her eat, so she floats away. Gwen grabs... not a knife and fork, but a pair of shovels... and proceeds over to the fresh grave, just dug earlier that day. She opens the casket... and cleanly chops the inhabitant's head above the eyebrow. She reaches in, removes the brain... and, you know it... takes a big old bite. 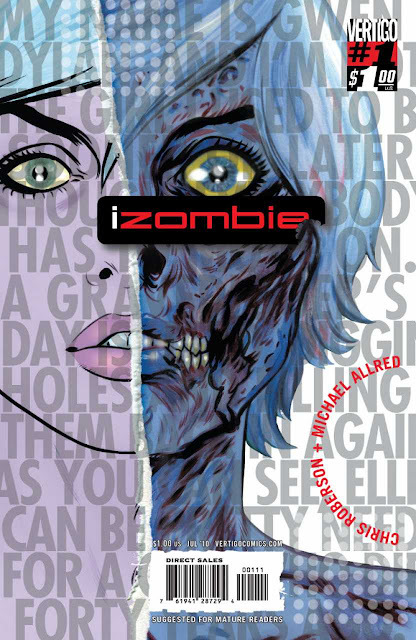 So yeah, spoiler alert... iZombie is about aZombie! Gwen is not your every day garden variety walking dead... if she eats a brain once a month she is able to stop herself from becoming your standard "mindless and shambling" sort of undead. The thing of this is... and this is such an awesome idea... the memories of the brain she eats wind up inside her. This fella was murdered... and is crying for vengeance... and justice. It's gonna be up to Gwen to catch this guy's killer! So good. I can't for the life of me understand why I never kept up with this book. The only thing I can figure is that it was a $1 impulse buy... and I somehow filed it away unread. Because, lemme tell ya... had I read this in 2010, there's no way this would be the only issue in my library. Maybe it was just the zombie aspect of the thing. I never fell into the zombie craze of the past decade and change. I've always thought they were pretty lame... and still do. Close-minded? Perhaps... but I yam what I yam. Either way, I dug the hell out of this issue. Had a lot more fun with it than I ever expected when I plucked it outta the longbox. I appreciate that this is a novel take on the zombie... er, mythology? Having our star as a zombie... who understands how to keep her baser zombie instincts at bay is quite an interesting wrinkle. Having her take the memories from her meals to find ways to exact vengeance is such an awesome storytelling device. It sets up a perfect arc-driven approach... which I gotta say, I'm now kicking myself for not following while it was on the shelves. The writing was excellent. The character of Gwen is instantly likable... as is most of (if not all of) the cast (at least at this point)... The art? Whattaya want me to say? It's Mike Allred. If you like Mike Allred, you'll like this. I do like it... so, I think this is amazing. I'm always impressed with his cartoony style juxtaposed with his mastery of sequential storytelling. Just a marvel. I understand there's a television adaptation of this show... which, if I'm being honest, I'm not going to watch. Not for any "headcanon" rationale, just that (silly as it sounds) I really don't have the time to invest in a TV show. Hell, the Flash is one of my favorite heroes/books, and I can't bring myself to care about his small-screen exploits... just ain't my thang. I will, however, be on the look out for single issues and collected editions of this book to follow it along. Overall... snag this one if you see it. Watch the show if that's your thing. Either way, I believe this one is worth your time. I think Netflix has a tv show of this. maybe... Knowing would require that I had time to watch things on Netflix. Great review, Chris. I've been curious about the t.v. show but it kinda came across as a Buffy The Vampire Slayer thing. Still, it makes me hopeful that DC will put some more effort behind their Vertigo imprint.